New Delhi: Pravakara Moharana and Gobardhan Panika from Odisha received Padma Awards from President Ram Nath Kovind on Tuesday. 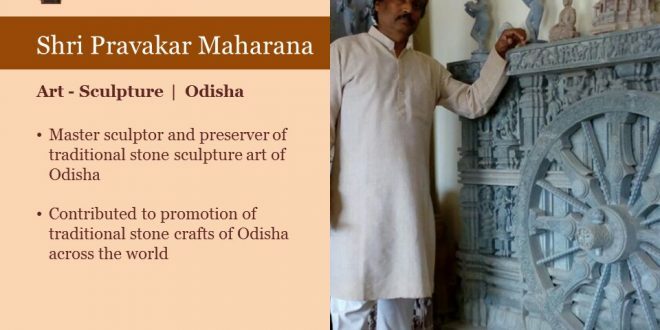 The two Odia were among 84 persons, who have been named to receive the country’s highest civilian honours. 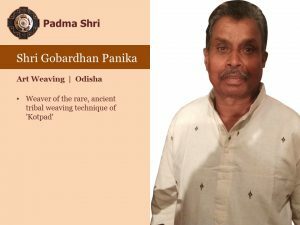 Moharana and Panika were conferred with Padma Shri for Art-sculpture and Art Weaving, respectively by the President. The function was held at the Rashtrapati Bhavan here with the attendance of Vice-President M Venkaiah Naidu, Prime Minister Narendra Modi and his Ministerial colleagues. This year, as many as 84 Padma awards were announced. The list comprises three Padma Vibhushan, nine Padma Bhushan and 72 Padma Shri awards. The awards – Padma Vibhushan, Padma Bhushan and Padma Shri – are announced on the eve of the Republic Day every year.